Months ago I saw a post from Chocolate-Covered Katie on 10 Healthy Summer Recipes which included a link to all Katie’s recipes for Vita-Mix Ice Creams and I have been thinking about them ever since. The blackberries in my front yard were volunteering to be the first experiment. So happy they were calling me because it came out delicious! Thanks to my parents who gave it to us as a gift when we had the little vegan to make baby food (though she wouldn’t eat it), we have a Vita-Mix. Point of this is I am not sure how it would work in a different blender. I would love to hear how it goes if you try with a different blender. One tip I learned from my experience is to make sure you freeze the mixture in a container small enough that it fits in the blender so it can reach the blades. I had to cut my frozen brick to fit, which wasn’t fun. You will probably need to freeze it in two small containers or a few ice trays. Put almond milk, 1/2 cup blackberries and maple syrup in blender and mix until liquid. Pour liquid into containers and freeze. Once completely frozen a couple hours) set out to defrost enough so that it falls out of container (it took mine 10 minutes in a warm house.) Put in blender and add remaining blackberries. Blend on high for 1 to 2 minutes. You may need to push down ingredients. Serve and enjoy! I loved this and can’t wait to play around with more flavors. 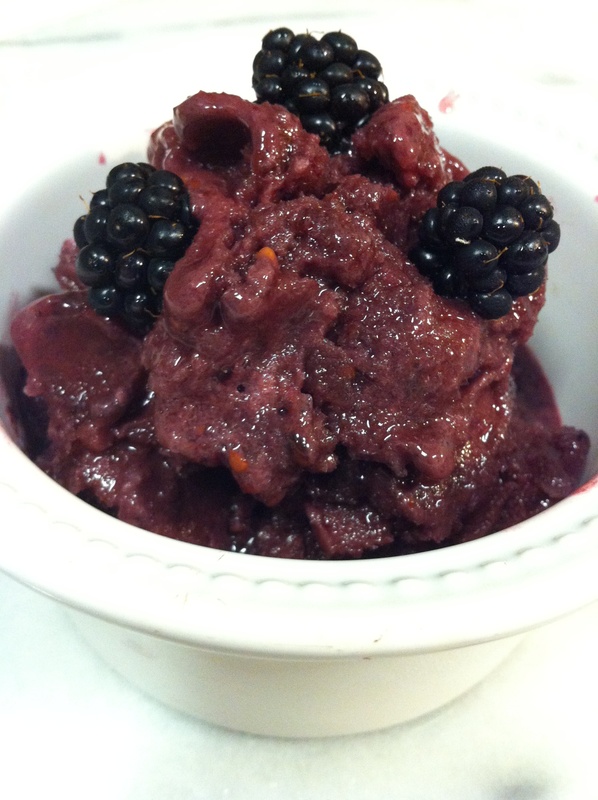 Gallery | This entry was posted in Almost Raw, Anzia's picks-a young vegans perspective, dessert. Bookmark the permalink.